Sweden-based Aptahem is on its way to redefining the treatment of sepsis and other life-threatening inflammatory diseases. Leveraging deep expertise in immunology and parasitology, Sweden-based Aptahem has turned a deadly protozoon into a source of multifunctional drug candidates with antithrombotic and anti-inflammatory properties. Now, with its lead asset nearing human testing, Aptahem is looking for sup­port to evaluate the candidate’s efficacy and, when appropriate, deliver the drug to patients with sepsis as quickly as possible. Aptahem is underpinned by research by Lund University, Karolinska Institutet, and the Swedish Institute for Communicable Disease Control. The research centered on aptamers, oligonucleotides that fold into complex shapes and bind to specific targets. These molecules mimic antibodies but have features that make them more desirable than the better-known modality, such as low immunogenic­ity and simple, low-cost production. The potential for aptamers to be a safer, more effec­tive alternative to antibodies led to research into their clinical applications, including the study of a malaria model. The research suggested aptamers could dissolve the blood clots formed by malaria-causing parasites to support their own survival, thereby allow­ing blood to flow freely in the brain and potentially preventing stroke. Luiza Jedlina, who now serves as Aptahem’s CSO, saw the broad implications of this finding. An aptamer that clears clots could have applications in a multitude of major, coagulation-drive diseases. This insight stemmed from the unique perspective Jedlina brings to research as a result of her experience with vaccines and history of working at the nexus of immunology and parasitology. Jedlina’s background gave rise to a novel, cutting-edge company. Pursuing her insight, Jedlina further investigated and developed the technology, lead­ing to the formation of Aptahem in 2014. Since then, Jedlina and her team have put the technology through a series of tests. The studies showed that Aptahem’s aptamers are unusually safe molecules that have powerful effects on coagulation and inflammation, and improve survival in animal models of sepsis. As a result, Aptahem is on the cusp of the clinical validation of its belief that candidates derived from the deadliest human parasite can treat some of the most pressing unmet medical needs. Aptahem took a novel approach to the discovery and refinement of drug candidates. Typically, researchers identify a target involved in a critical disease pathway and try to synthesize a drug that acts on it. The team designs and refines candidates until they find one with the desired affinity and specificity for the recep­tor. That drug then advances further into preclinical testing and into trials in humans. Led by CSO Jedlina, Aptahem essentially took the opposite approach. The team started with the drug, not the target. Instead of striving to find a molecule that interacts with a particular target, Aptahem worked to understand the applications of a pre-existing but undiscovered drug. The approach is underpinned by the millions of years of evolution that led to the creation of proteins by Plasmodium falciparum, the unicellular protozoan parasite that causes malaria. The parasite uses the proteins to facilitate its survival inside the human host. These protein–host interactions glue red blood cells to each other and to other cell types, weaken the host’s antibody response, enable immune evasion, boost the production of inflammatory cytokines, and disrupt anti-inflammatory pathways. Plasmodium protozoa act on these processes to avoid attacks by the immune system and other­wise create conditions favorable to their survival. Aptahem saw one of the proteins as a blueprint for a pipeline of drugs. This revelation stemmed from recognition of the protein’s effect on multiple key disease processes—inflammation, coagulation, and the immune system—and an understanding that evolution had developed a molecule more finely attuned to life inside the human body than researchers ever could. Using the protein as a starting point, Aptahem designed and selected serum-stable RNA aptamers. These RNA oligonucleotides bind to multiple targets with great affinity and specificity. Once bound to a target, the aptamers stop other molecules from inter­acting with the receptor. The result is a pipeline of drug candidates, led by Apta-1, that play an opposite role in the body to the protozoan protein. The protein causes immune dis­ruption, coagulation, and inflammation to protect Plasmodium from the host. The aptamers stimulate the immune system, inhibit inflammatory cytokines, reduce the growth of blood clots, and stop coagula­tion to improve health outcomes. Aptahem has established two patent families to protect its innovations. The first family covers the matter of three Apta candidates and has been granted protection by patent offices around the world. The second, patent-pending family covers the mechanism of Apta-1 and its clinical applications. The multifunctional nature of Aptahem’s aptamers means that the company could target the drugs toward a number of major unmet needs charac­terized by coagulation and inflammation. Initially, Aptahem is focusing on sepsis, a disease driven by blood infections that kills almost 400,000 people in the United States every year1. This makes sepsis as deadly as breast, colorectal, and lung cancer com­bined (Fig. 1). Sepsis kills and causes irreversible harm by creating an imbalance between coagulation and inflamma­tion. This leads to critical medical reactions, organ and tissue damage, and death. If doctors intervene early and promptly, the risk of permanent damage and death is reduced. However, doctors’ ability to make such effective interventions is limited by the drugs at their disposal. Today, doctors typically use antibiotics to treat the underlying infection and adrenaline to address the drop in blood pressure that leads to septic shock. None of the available therapeutic options treat the full spectrum of abnormal reactions that characterize sepsis and drive negative patient outcomes. Early data suggest Apta-1 could be such a full-spectrum treatment. Building on research that vali­dated Apta-1’s anti-inflammatory, anticoagulant, and immune signaling effects, Aptahem has tested the aptamer in preclinical sepsis animal models. Aptahem saw significant, dose-dependent increases in the survival rates of animal models of sepsis treated with Apta-1. Significant treatment effects were achieved when Apta-1 was adminis­tered at different time points, suggesting it may be possible to deliver repeated doses of the aptamer. The studies also generated evidence that Apta-1 restores blood circulation and acts positively on clini­cal biomarkers tied to organ health. 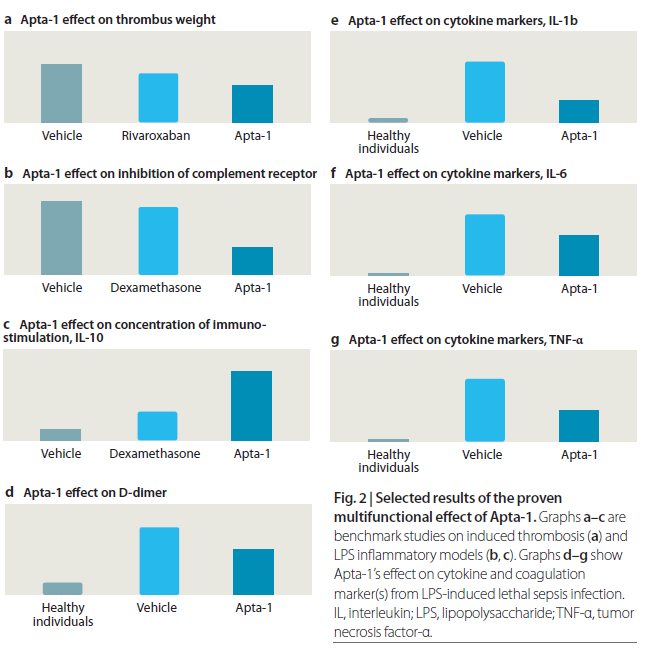 The data portray Apta-1 as a uniquely efficacious sepsis treatment and have impressed clinicians and life science companies around the world (Fig. 2). Toxicology results also suggest the aptamer is unusually safe. Following intravenous administration, Apta-1 is stable and active in the plasma with a half-life of 20 minutes, and there is a sink-in effect through endothelial binding at the first dose. The body expels the drug naturally. Aptahem is yet to see any side effects and has administered Apta-1 at several times the proposed therapeutic dose. The safety finding is striking given the processes on which Apta-1 acts. Drugs that stop coagulation are prone to bleeding-related side effects. Historically, these side effects have been an almost inevitable complication of the prevention of blood transition­ing from a liquid to a clotted gel. However, data sug­gest Apta-1 is less prone to cause this problem. The mechanistic explanation may be that Apta-1 affects coagulation through the inflammatory system, rather than by directly targeting blood clotting. Apta-1 is the most advanced drug to emerge from Aptahem’s research into the Plasmodium protein, but the multifunctional nature of the aptamers means plenty more opportunities await the company. Aptahem is currently fingerprinting Apta-2 to understand how it overlaps with Apta-1. Both drugs are derived from the same Plasmodium protein but look structurally different. Aptahem also expects the drugs to have different therapeutic profiles. Once a clearer understanding of the differences is estab­lished, Aptahem will decide on a target indication for Apta-2. The drug’s versatility means an array of anti-inflammatory, anticoagulant, infectious, and metabolic diseases are possibilities. However, Apta-1 is the near-term priority. Preclinical safety tests of the lead candidate are now under way. Once Aptahem has data from the studies, it will file to run a first-in-human clinical trial of the aptamer. To support the transition into the clinic, Aptahem appointed Anders Bylock as CMO. Bylock was instru­mental in the decision on the lethal septic indica­tion, brought Hans Peter Schwarz and Mats Eriksson on board, and created the scientific advisory board. Collectively, the trio have extensive knowledge of the role of coagulation in sepsis and have worked on 50 drugs, at companies including AstraZeneca, Boehringer Ingelheim, Baxter, and Merck Sharp & Dohme. With the support in place, an internal team well versed in everything from tech transfer onward, and money in the bank, Aptahem is equipped to finalize the phase 1 itself. However, recognizing the importance of advancing Apta-1 as quickly as possi­ble, Aptahem is looking for outside support to accel­erate its progress. Management at Aptahem is open minded about how to achieve this goal. Investment, co-development, and out-licensing deals are all possibilities. In parallel, Aptahem is considering in-licensing technologies that support its pipeline. The business development activities are under­pinned by a belief that Aptahem can build a signifi­cant company around the platform and the team it has assembled over the past 4 years. In that time, Aptahem has unravelled millions of years of evolu­tion and designed a candidate with the potential to treat a major unmet medical need. That is just the start. In the coming years, Aptahem will show whether the data generated on Apta-1 to date translate into improved outcomes in patients with sepsis. If successful, Aptahem will redefine sep­sis care and clear the path to advance its expanding pipeline of multifunctional aptamers in a range of life-threatening diseases driven by coagulation and inflammation. Global Data. 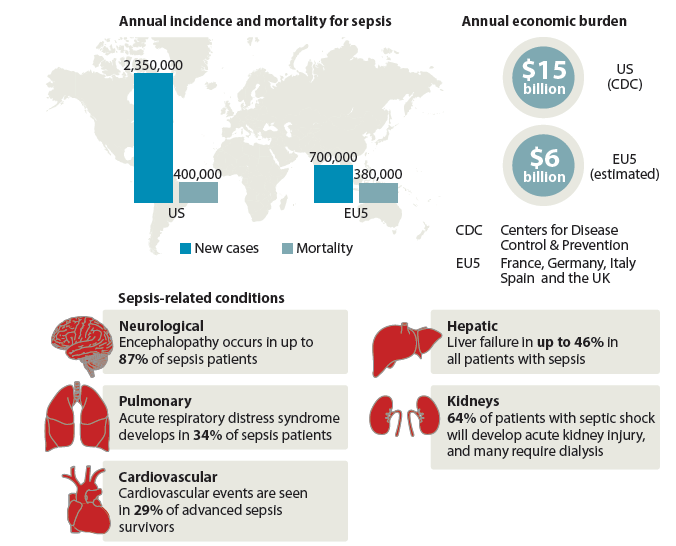 OpportunityAnalyzer: Sepsis and Septic Shock — Opportunity Analysis and Forecasts to 2026. Report No. GDHC071POA (Global Data, 2017). Global Data. OpportunityAnalyzer: Sepsis and Septic Shock Opportunity Analysis and Forecasts to 2026. Report No. GDHC071POA (Global Data, 2017). Hall, M. J. et al. Inpatient care for septicemia or sepsis: a challenge for patients and hospitals. NCHS Data Brief. 2011;(62):1-8. Iskander, K. N. et al. Sepsis: multiple abnormalities, heterogeneous responses, and evolving understanding. Physiol Rev. 2013;93(3):1247-1288. Singh, G. et al. Incidence and outcome of acute lung injury and acute respiratory distress syndrome in the surgical intensive care unit. Indian J Crit Care Med. 2014;18(10):659-665. Yende, S. et al. Risk of cardiovascular events in survivors of severe sepsis. Am J Respir Crit Care Med. 2014;189(9):1065-1074. Yan, J. et al. The role of the liver in sepsis. Int Rev Immunol. 2014;33(6):498-510. Bagshaw, S.M. et al. Acute kidney injury in septic shock: clinical outcomes and impact of duration of hypotension prior to initiation of antimicrobial therapy. Intensive Care Med. 2009;35(5):871–881. Aptahem AB is a Swedish-based biotechnology company that develops innovative aptamer-based drugs targeting inflammation and coagulation for the treatment of life-threatening conditions. The portfolio under development consists of multifunctional aptamer (synthetic constructed nucleic acid polymers) drug candidates with anti-coagulant, immunostimulant and anti-inflammatory properties. The company’s primary pharmaceutical candidate, Apta-1, is being developed with the aim of preventing the high mortality rate caused by the severe inflammatory response that leads to organ and tissue damage in sepsis patients. The multi-functional profile of Apta-1 has shown to improve the survival of animals in a dose dependent manner in a lethal sepsis model in an unprecedented way. Aptahem is also investigating a second candidate, Apta-2, for the treatment of inflammatory diseases. The company holds patent protection in strategic target markets and actively seeks business development opportunities with potential collaborators.